← The ‘Where To Look’ Method. First Point of Aries. In astronomy, we need a celestial coordinate system for fixing the positions of all celestial bodies in the celestial sphere. 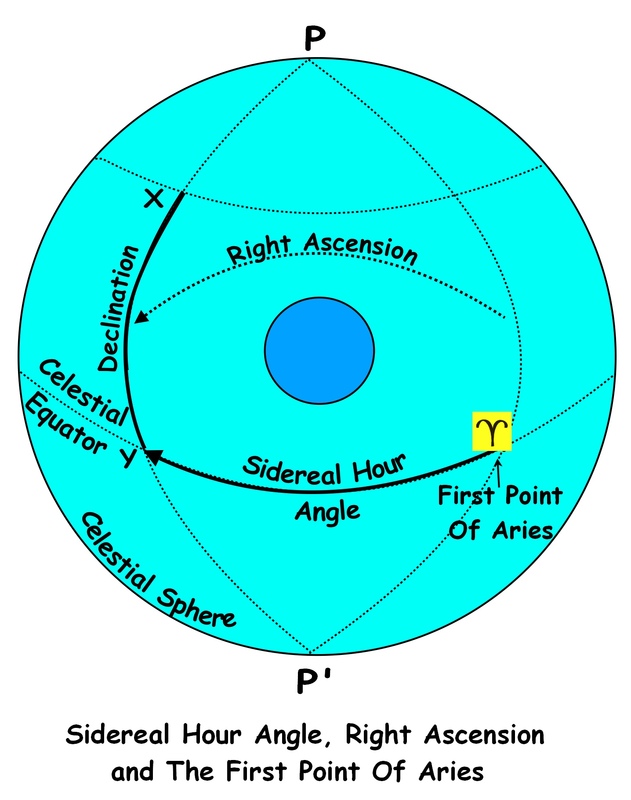 To this end, we express a celestial body’s position in the celestial sphere in relation to its angular distances from the Celestial Equator and the celestial meridian that passes through the ‘First Point of Aries’. This is similar to the way in which we use latitude and longitude to identify a position on the Earth’s surface in relation to its angular distances from the Equator and the Greenwich Meridian. Just as the Greenwich meridian has been arbitrarily chosen as the zero point for measuring longitude on the surface of the Earth, the first point of Aries has been chosen as the zero point in the celestial sphere. It is the point at which the Sun crosses the celestial equator moving from south to north along the ecliptic (at the vernal Equinox in other words). This point is known as the ‘First Point of Aries’ because in 150 B.C. when Ptolemy first mapped the constellations, Aries lay in that position. However, although still named the ‘first point of Aries’, due to precession, the vernal equinox now lays in the constellation Pisces. The following diagram illustrates the concepts discussed above. is the First Point of Aries. The Sidereal Hour Angle is the angle PY. That is the angle between the meridian running through the First Point of Aries and the meridian running through the celestial body measured at the pole P. It can also be defined as the angular distance Y. That is the angular distance measured westwards along the Celestial Equator from the meridian of the First Point of Aries to the meridian of the celestial body.